The cutlery Maserin , born in 1960 , following the tradition of craftsmanship which over the centuries has led Maniago , knives of the city , to excel in the world for the quality of its products. Through steady growth, evidenced by the commercial prestige acquired worldwide , the company using the most modern techniques (Laser, CNC , CNC machines ) helps to maintain the prestige of Maniago knives . With the experience gained in over 50 years in business, a constant search for new materials and the special attention paid to design , MASERIN today the brand is synonymous with quality, style and evolution. 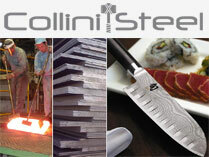 The range of products offered includes knives : Sport -utility , High Tech , Hunting , Collection, Miniature. In the tradition that distinguishes this family business from the beginning , all the processing steps are carried out internally : we also closely monitor the manufacturing of our products , from design to construction , operating an accurate control over the quality of the finished product . The company also provides customized solutions for all kinds of requests , creating custom models exclusively , developing projects finished knives or individual components according to customer needs. From the beginning, our goal is to put at the service of customers the professionalism and skills acquired , to ensure cutting tools of high quality and value.